In this post i will be talking about Broken Cryptography. As per OWASP-Mobile Security Project Broken Cryptography is on the 6th position. In this post i will be talking about certain vulnerabilities which are created by implenting either insecure cryptographic implementation or by implementing in a insecure way. Use of Insecure and/or Depcreated algorithms. Now open that .jar file in Jg-Gui and open up the StatmentDBHelper class as shown below. 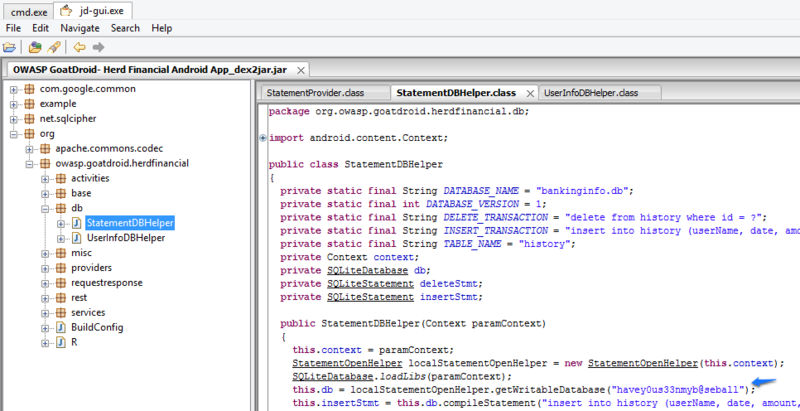 You can see above that password for encrypting db files are stored in HerdFinancial Application. Passwords are hammer and havey0us33nb@seball . So anyone with HerdFinancial Application can get password using reverse engineering and then decrypt the content using those keys. Most of the time Application developers create and use their own Encryption Algorithms or Protocols, which utlimately create new vulnerabilities. While developers have some valid reasons for using Custom Encryption Algortihms/Protocols like default SSL Libraries are not that fast and efficient for their purpose. There is a Awesome library Conceal which was developed by Facebook suitable for Applications wanted to Encrypt large files in an efficient manner.